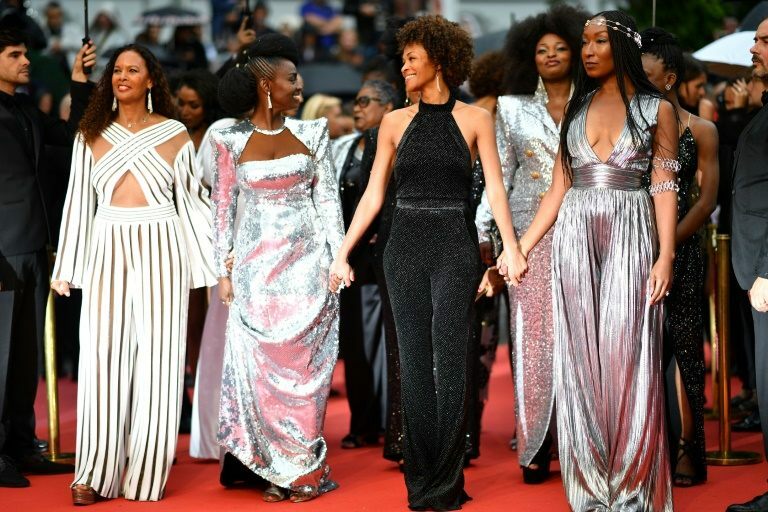 CANNES: Sixteen black and mixed-race actresses staged a glamorous red carpet protest at the Cannes film festival Wednesday to denounce everyday racism in the French industry. Led by Bamako star Aissa Maiga, they also launched their new book Being black is not my job (“Noire n’est pas mon metier”), denouncing the prejudice they have suffered from directors and casting agents. But the heavens opened as they stepped out onto the red carpet from their cars wearing spectacular gowns by Balmain’s mixed-race designer Olivier Rousteing. Their march follows hot on the heels of a historic red carpet demonstration Saturday by 82 Hollywood stars, women directors, producers and scriptwriters, led by Cate Blanchett, demanding equal pay and status. “I was moved to act by the spirit of the times,” Maiga told AFP, who said quotas “could be a possible option” for combatting the lack of black faces on screen, even if that would spark vehement opposition in France. One of the actors who took part, Nadege Beausson-Diagne, said in the book that she had been asked if she spoke “African” at a casting.